#StickStarReport18: #3 Woodlands 9 #6 St. Marks 3. Saturday at Norma and Lamar Hunt Family Stadium, sophomore attackman Dylan Binney registered four goals and brought a ton of energy to help lead the No. 3 Woodlands Highlanders to a 9-3 victory over the No. 6 St. Marks Lions in inter district play. Also generating offense for the Woodlands were seniors Jack Barron, and Ramsey McCreary each with two goals, and James McDowell with a goal and an assist. Heading into this matchup the Woodlands were coming off of a one goal loss to Highland Park last weekend. More important than the regular season loss however, was the injury to senior midfielder, Quinn Binney. Binney was a heavy lifter in between the lines and an on field general. The Lions were coming off of a 4 goal victory against Allen midweek. For the Lions Willy Wood finished twice, Connor Cheetum had two assists, and Garrett Mize added a bucket. This game was close during the 1st half, and in the 2nd the Woodlands really started to create some distance. The two teams were tied at one at the end of one, the Highlanders held a 3-2 lead at the end of the 1st half, and heading into the final quarter the Woodlands pushed it out to 6-3. Saturday’s contest was a rematch of the final game of last years Dallas Super Regional. The Woodlands was able to grind out a 9-6 victory against a spirited Lions group that defeated Lake Travis the day before. This game had a similar look and feel in the 1st half, but the Lions simply didn’t have enough juice in the 2nd half. For the Woodlands the defensive consistency and overall ability has been unbelievable. To give up only 3 goals against St. Marks, 5 to Highland Park, 4 to Jesuit, and 5 to Lake Travis and Westlake respecitively is pretty big time. The lynch pin in goal has been junior Jason Kroslowitz. The lefty has been sensational in cage and took at least 3 goals off the board against the Lions. His ability to step in for Gunnar Luckowski and be dominant has bolstered an already confident group. For the Lions, the defensive group really played very well in the 1st half, but it was the sustained Woodlands possession in the 2nd half that ultimately led to attrition on that side of the field. The top two initiating offensive threats for the Lions are seniors Garrett Mize, and Sam Schroeder and they simply weren’t able to get loose against this group. Those two players have to do a lot for the Lions and Saturday the Highlanders defense really made things difficult. 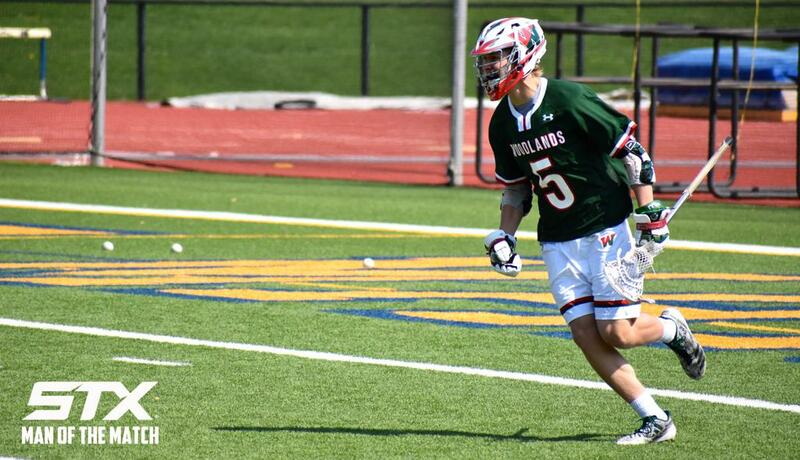 One of the bright spots for The Woodlands Saturday was sophomore Dylan Binney’s 4 goal performance. Binney wore his brothers #5 jersey as the Highlanders have historically had a Binney on the field wearing #5 for quite sometime, as their older brother Connor wore it prior to Quinn and Dylan. While the older players were reeling a bit from the injury, the younger inspired brother scored the first goal of the game, 3 of the 1st 4 Highlander goals, and the 1st goal of the 2nd half. If the Woodlands needed some extra “will power” Dylan definitely brought it Saturday. The Highlanders now have two local HTX games against Strake Jesuit and Kingwood, while the Lions have Plano West this Tuesday, the SPC Tournament this weekend, and finally Highland Park next Thursday. We are essentially 2 weeks out from 2nd season, which is completely insane. #StickStarReport18 will have you covered every step of the way. We will be back out at Jesuit on Tuesday afternoon for the conclusion of the ESD vs. Jesuit game that was forced into an extended lightning delay. We’ll also bring you Live Stream Coverage of the Lone Star Alliance Conference Tournament from Caven Field down at the University of Texas. #StickStarReport18 giving you consistent and comprehensive content all season long, 2nd Season is on deck! The excitement is building, a lot of this going on in the coming weeks!